Thanksgiving is coming, and it’s going to be at my house again (like it has been for the last 20 years or more). I’ve hosted so many times that I can almost plan the menu and prepare the food with my eyes closed. But I don’t. And even though I know what I’m doing, I still use my trusty planner to figure out what to do and when to do it. The first thing I do is pull out last year’s planner and read about how last year’s Thanksgiving went. Then I get out my calendar and highlight Thanksgiving on my monthly calendar so I can see at a glance how much time I have before the big day arrives. Since I have ADHD, I don’t always have a realistic view of how much time has passed or how much time is still remaining. 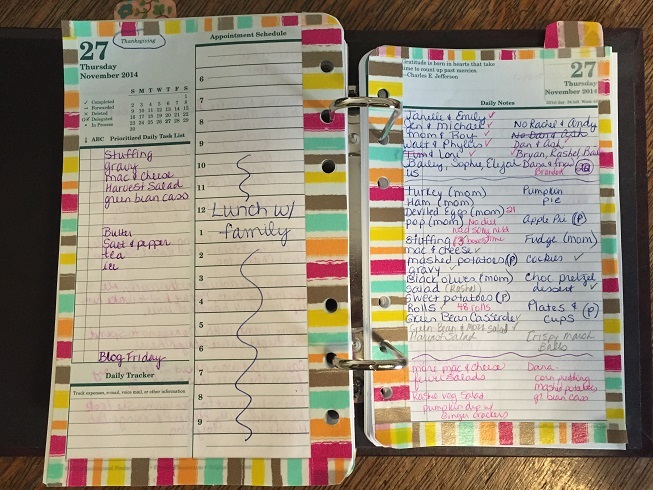 That’s why it’s important for me to have a visual reminder of exactly when the holiday is – more than just a box on the calendar – a HIGHLIGHTED box. 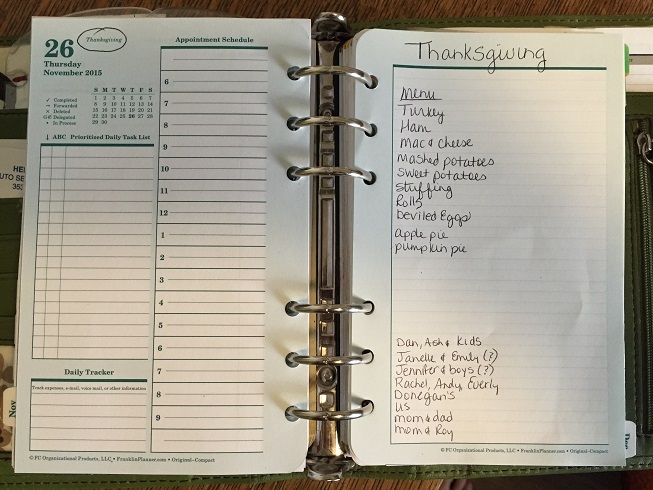 Then I go to the Thanksgiving page in my planner and insert a blank piece of paper. On that paper, I write down who I think will be coming so I can get a count. I also decide what time we’ll eat and write down a tentative menu. We like to have most of the same foods year after year but we tried to include a few new things each holiday. Anyway, on that blank piece of paper I jot down any thoughts I have about the menu, the guest list or anything else about the holiday. I start doing this in October at the latest. As November gets closer, I start finalizing the recipes and assigning foods to other family members (I let them tell me what they want to bring and then make it fit the menu). I write on the Thanksgiving planning page who’s bringing what. A few weeks before Thanksgiving I start writing down all the extra things we’ll need like plates, silverware, napkins, salt & pepper, butter, coffee (I always forget coffee), ice, etc. It sounds silly to write all that stuff down but I want to make things as easy and mindless as possible on Thanksgiving. I don’t want to forget anything and I don’t want to be stressed. At the beginning of the week of Thanksgiving I write out a plan. My plan includes what I’m cooking and when. I get pretty detailed about what needs to be done when. And I post that plan so it’s visible to everyone. Then if they want to help, they have a better idea of what to do and I know what to tell them. And then . . . when it’s all over, I write details on my notes page about how it went and what I might want to do different or the same next year. And before the lights go out on Thanksgiving, I move on to Christmas . . . no wait, I already started planning for Christmas. But that’s an article for another day!! !